I am writing to invite you to share this Prayer for Australia with your prayer group, church or network. The prayer was written as a result of God’s deeply impacting us in one week through two groups of intercessors –women in central Australia and 11 women who came from Nigeria with a word for Australia. Pray we, the Body of Christ, will awake and declare the sovereignty of Jesus over Australia at this vital time. 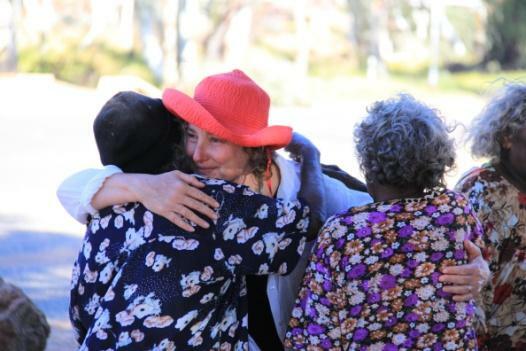 Across Easter 20-27th April, a team of 12 travelled with Lloyd and Gay-Marie Hollingsworth to bring Healing of the Land teachings to Ernabella in central Australia. We witnessed the inland flooding foretold by many during the drought as the time when God’s Spirit would move across our nation. Within hours of arriving in remote Turkeybore, a key group of intercessors arrived – fasting, weeping and overflowing with joy. Again and again over that week they embraced me -intimately whispering ‘Jesus’ and releasing His grace and power. Into my heart, into my heart, come into my heart, Lord Jesus. Jesus in the heart of Australia! These Christians deeply desire that their rich heritage in Christ is passed on to the next generations of their families. Join us in praying that this generation of original Australians receive their full inheritance in Christ! We believe God is speaking to the nation of Australia to warn and encourage us to come into intimacy with Jesus; to pray for; trust and align ourselves with God’s intervention. God’s Spirit is calling us from idolatry in all its forms. Only Jesus’ sovereignty releases abundant life and prevents the enemy coming in to steal, kill and destroy. Praying this Prayer for Australia is a simple way to unite as Australians to seek Jesus’ sovereignty over our nation. You can read the Prayer for Australia here. During the winter season I will be over in Australia, in N.W. NSW at Lightning Ridge and I will take this’ prayer for Australia’ with me in my heart.